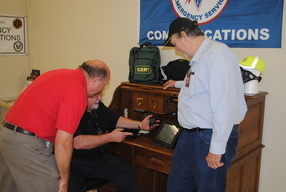 Randall Lorenz demonstrates a radio for Section Manager John Bigley and a prospective new ham. Nevada Section Manager John Bigley, N7UR, recently received an in-depth tour of the newly opened Washoe County ARES Amateur Radio Outreach Center and the Great Western Marketplace facilities. Randall Lorenz AF7HD, who is an ARRL Public Information Officer embedded with the WCARES group gave Bigley a comprehensive viewing of not only the WCARES suite, but also of the entire Great Western Marketplace facility. The Great Western Marketplace is a huge 167,000 square foot retail incubator, designed to give small and start-up businesses a brick and mortar site from which their enterprises can grow and prosper. Space for the Amateur Radio Outreach Center was made available thru the generosity of the Naumann Family of Reno, owners and developers of the GWM. Since opening, the Amateur Radio Outreach Center has had a steady stream of people stopping by to learn more about amateur radio, it's role in emergency communications, and the various hobby aspects associated with ham radio. "I am really impressed with the number of people who are being introduced to amateur radio via this Outreach Center," said Bigley. While at the facility, SM Bigley had an opportunity to speak with several prospective hams as well as a few licensed operators who stopped by. The center is a resource for area hams, offering information about joining ARES, up-grade classes, continuing education, community resources, and ARRL services. Great Western Marketplace CEO Trudy Naumann welcomed SM Bigley to the facility. Ms. Naumann expressed GWM's commitment to assist amateur radio in the Reno-Sparks area, not only by the donation of the area which WCARES is is using, but also by making classroom and meeting space available, and by hosting special amateur radio events such as Field Day. Section Manager Bigley congratulated the Naumann family on the inauguration of the facility and thanked them for their support of amateur radio in Nevada. The Washoe County ARES Amateur Radio Outreach Center is open Friday and Saturdays 10:00 AM to 5:00 PM and on Sunday from 11:00 AM until 4;00 PM. PIO Lorenz is the primary person staffing the center. "Washoe County ARES should be commended for taking the initiative to make this center a reality," Bigley said, "and Randall Lorenz deserves a big round of applause for the dozens of hours he puts in every single week staffing this venue." Nevada Section Public Information Officer Chuck Farnham WD6CHC of Fallon was the guest Tuesday morning on the "Just The Facts" radio show on America Matters Media stations 101.3 FM and 99.1 FM. 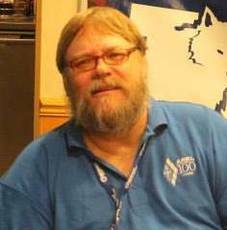 ARRL President Kay Cragie-N3KN has announced her appointment of Mike Lee-AA6ML to the position of Vice-Director of the Southeast Division. Lee (former WB6RTH) is well known to Amateur Radio Operators in Nevada having resided here for a number of years before locating to Florida in 2008. He still remains involved with Nevada ham activities and repeaters. Mike currently is President of the Flagler Palm Coast Amateur Radio Club and is the Section Emergency Coordinator for the North Florida Section. He is an Extra Class licensee and holds both First Class Phone and First Class Telegraph licenses. Mike replaces Jim Millsap-WB4NWS of Acworth, Georgia, who is resigning January 1st due to changes in his employment. Lee joins newly elected Director Doug Rehman-K4AC of Mt. Dora, Florida in the Southeast Division leadership. Rehman, narrowly defeated two-term Director Greg Sarratt-W4OZK of Huntsville, Alabama with a vote of 961 to 949. Rehman ran as a reform candidate, promising to bring innovation and change to the ARRL Board. 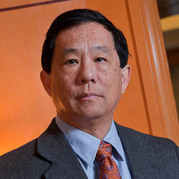 Mike Lee is the Senior Vice President and Chief Innovation Officer for Palm Coast Data. For the first time in more than 3 years all of the National Weather Service Field Offices in Nevada were represented in the annual SKYWARN Recognition Day activities. WX7LKN in Elko and WX7RNO in Reno have operated the past three years minus the Las Vegas station. This year the Elko and Reno teams were joined by WX7LAS from NWS Las Vegas. The Las Vegas group was active on HF and IRLP. Additionally, they checked into the Navy MARS, Air Force Mars, and ARES Nets. The group also sent several messages via the WINLINK system. Saturday, September 15, 2013 got a few VEs together in Ely, Nevada to get some testing done. Found out that they were having a problem with not enough VEs in the area to get all the testing done and some volunteers got together to help out. Just for information, there is another test session like this schedule for next spring and fall again. They will be held on May 18, 2014 and also on September 13, 2014. These are both Saturdays in conjunction with the Nevada Open Road Challenge and the Silver State Classic Challenge. This session had the following VEs; Leo Marchetti, AD7VP of Pahrump, Nevada; Stewart Moss, KF7KQK of North Las Vegas, Nevada; Michael Cripps, AE7MU of Spring Creek, Nevada; Richard Cozad, KF7KQM of Las Vegas, Nevada; and Herbert Portillo, KF7KQN of Las Vegas. sessions in the future. This is just another good example of Hams helping Hams. Great going team and good luck on future testing. successful day. Of course, I consider every race a success when there are no real serious accidents and everyone is safe at the end. sunrise. 1/2 dozen hams showed up. did nice demos on ALE and Winmor in actual use. Great show and tell. Contacts were made on 10, 12, 17, 20, 30 meters with stations as far away as Puerto Rico. to hear us. 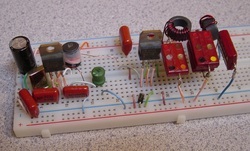 Modes used included CW, SSB, FM, and Pactor. Great learning experience for me. Aliante Casino will provide a parking lot on the east side of the complex for a swapmeet and will be offering special rates on rooms for out-of-town attendees. A planning committee meeting will be scheduled soon. You say you don't have a hundred bucks to spend on a QRP kit? Well how about building one from an old burned out CFL light bulb? What if the first QSO is nearly 2000 kilometers?